The sleet that started last night lasted quite a while. However, we stayed above freezing and it was just about all gone by this morning. However, we drove about 12 miles north to work on a different house this morning and there was a lot of ice there. 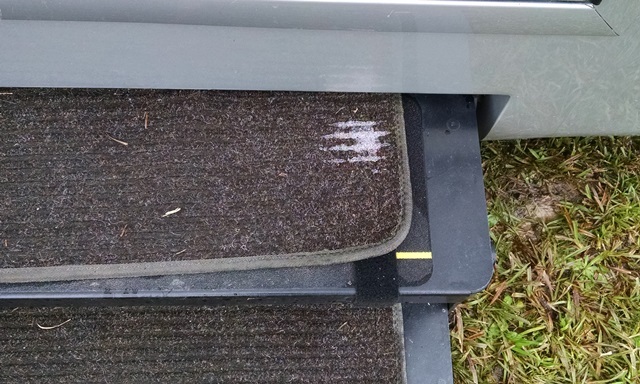 Their back deck was extremely slick. We really enjoyed seeing the sun this afternoon. Philip brought us devotion today. He began by asking us what we were afraid of in life. What to we worry about or what are we anxious about? Of course we all have internal and external sources of anxiety. A number of years ago Billy Graham said that we were living in the Age of Anxiety. Anxiety can be a crippling disease. God wants so much more for us. Read Philippians 4:8-9. Philip closed by reminding us we need to focus on God’s word. Thanks, Philip. Then we received our work assignments. Max, Anne, Nancy, Gary and Bruce went to a new assignment at Terry’s house. First thing on the agenda when we arrived as to help Terry get his son’s truck out of the mud he was stuck in. Everything is a muddy mess around here. Gary hooked a chain to the truck and pulled it right out. 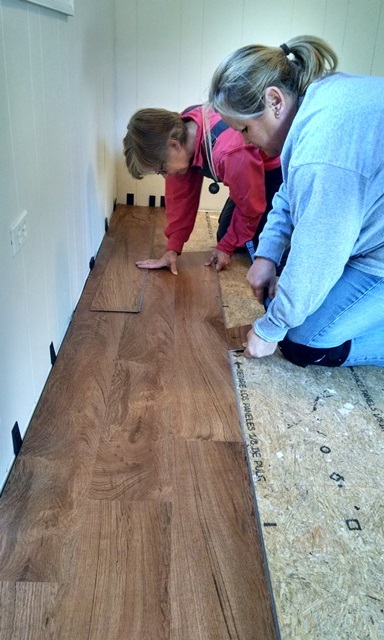 Anne, Nancy and Max began installing vinyl plank flooring in a bedroom. 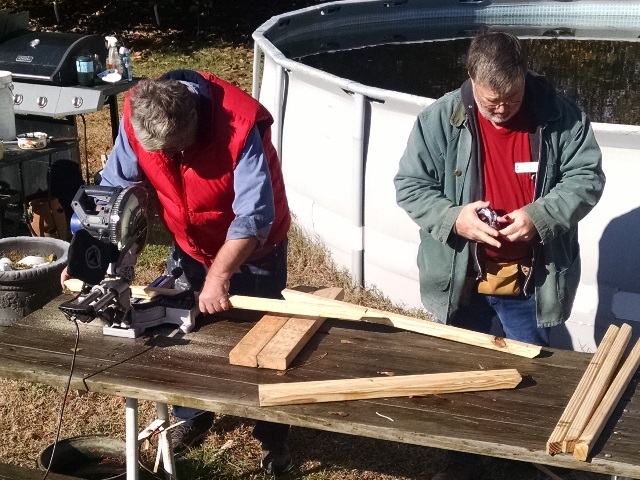 Max was also working with Bruce and Gary on the railing for the deck. 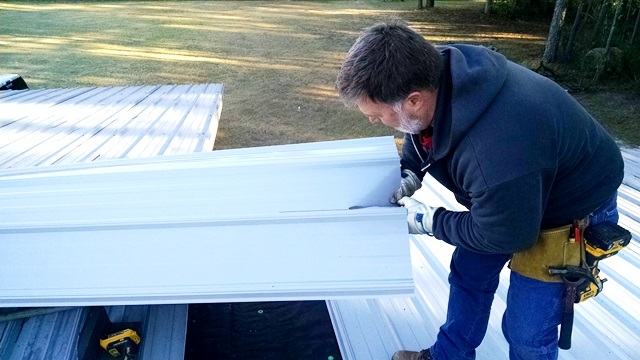 Another group repaired the decking and also repaired the flooring in the bedroom and installed ¾ inch plywood which we then installed the vinyl plank over. The guys needed more materials and got a materials list to Gene so he could make another trip to Lowe’s. 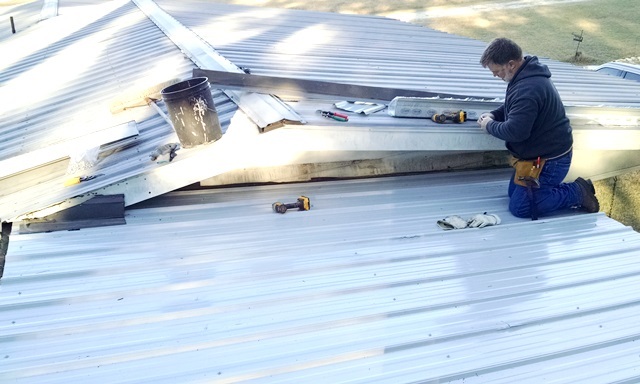 Gene also picked up the metal roofing for Elsie and Bruce’s house. The guys went over there right after lunch and installed the metal. 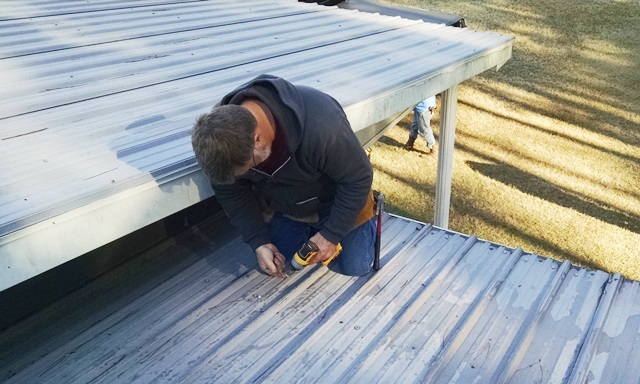 They got all roof panels installed and installed new flashing. They plan to go back tomorrow to install the ridge cap – have to do that before the rain returns on Thursday/Friday. Anne and Nancy continued on the vinyl installation. They have two rows left to install and then clean up to do. Don’t know if we are going to install the base board or if someone else will do that. Mary Ann and Cindy went back to Carolyn’s house that they started yesterday and completed sanding the drywall, priming and painting the bathroom. That house is now complete! Dave, Gene and Phillip were working at Jackie’s again but not sure what happened there today. We haven’t talked to anyone. Mary Ann said this afternoon we were going to try to finish everything up tomorrow because Thursday we have five Bible presentations to make. That will be the most we have done in one day. We also have dinner scheduled for Thursday night. Ann and Jeff are cooking for us. Busy time trying to get every home completed before we all pull out Friday morning. Previous Previous post: Rain, Rain Go Away!